Back to overviewBackHomeTable tennisTable tennis pusher "new"
This game is based on the standard table tennis. This game is ideal for people with a mental or physical disability. The ball also has a bell. With this sliding table tennis, the ball must be pushed over the blade. A special slider or elastic can be used for this. The blade also has raised edges so that the ball can not fall off the blade. 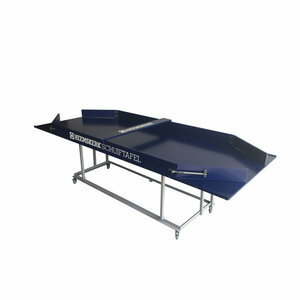 The sliding table tennis can be made to measure. And the edges are removable so that it can also be used as a table tennis table. If you have any questions, please contact us for detailed advice. Van den Broek Billiards is always ready for you. So feel free to call 0365374054 or mail to info@vandenbroekbiljarts.nl. Of course you can also visit us in our large assorted store at the Bolderweg 37 A / B - 1332 Az Almere-buiten.